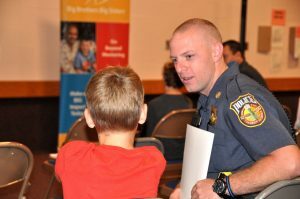 The Big Brothers Big Sisters of the Capital Region (BBBSCR) launched a new “Bigs in Blue” partnership with the Derry Township Police Department and Derry Township School District. 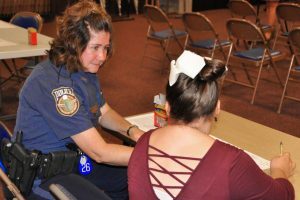 Police officers participating in the “Bigs in Blue” program spend quality time as mentors to students at Hershey Intermediate Elementary School. The program is a national initiative which was launched locally in 2016. 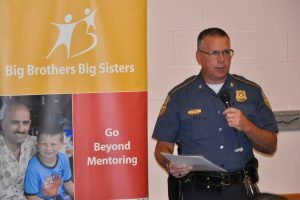 Today’s kick-off marks the 10th “Bigs in Blue” partnership in BBBSCR’s service area. The kick-off was held at Hershey Intermediate Elementary School and dignitaries from all partners spoke on the benefits of this program. Big Brothers Big Sisters programs are evidence-based; students in the programs develop strong relationships with adults, reduce risky behavior and maintain or develop positive attitudes towards education including improved academics and pursuit of college education. Derry Township’s “Bigs in Blue” program is made possible by funding from The Hershey Company and Hershey Entertainment & Resorts. The program is also generously supported by the Walmart Foundation. Big Brothers Big Sisters of the Capital Region (BBBSCR) provides children facing adversity with strong and enduring, professionally supported one-to-one relationships that change their lives for the better, forever. For more than 35 years, BBBSCR has kept its promise by expertly crafting and maintaining compatible mentoring matches between Littles (at-risk youth) and Bigs (mature volunteers) in Cumberland, Dauphin, Lancaster, Lebanon and Perry counties. Our commitment includes using evidence-based best practices to achieve personalized outcomes and support matches throughout their life (one to ten years). Contributions in all forms are vital to fulfilling the agency’s mission. BBBSCR is a 501(c)(3) charity, registered with the PA Bureau of Charities, and an affiliate of Big Brothers Big Sisters of America. 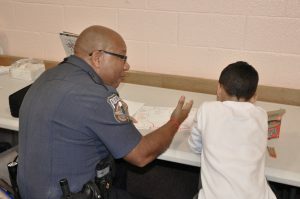 For more information, visit the BBBSCR website at www.capbigs.org.